Review by AllTheBestFights.com: 2018-06-09, pretty good fight between Alistair Overeem and Curtis Blaydes: it gets three stars (UFC Performance of the Night). The former K-1, Strikeforce and Dream world champion Alistair Overeem entered this fight with a record of 43-16-0 (88% finishing rate) and he is ranked as the No.3 heavyweight in the world (currently the #1 in this division is Stipe Miocic). The Reem fought three times last year beating Mark Hunt (Overeem vs Hunt 2) and Fabricio Werdum (Werdum vs Overeem 3) but then he lost to Francis Ngannou (Alistair Overeem vs Francis Ngannou). His opponent, Curtis Blaydes, has an official mma record of 9-1-0 (78% ko/tko victory rate – he has never won via submission) and he entered as the No.8 in the same weight class. He suffered his only loss when he faced Francis Ngannou in 2016, after this fight he has collected four victories and one no-contest defeating Alexey Oleynik (Alexey Oleynik vs Curtis Blaydes) and Mark Hunt in his last two (Mark Hunt vs Curtis Blaydes). 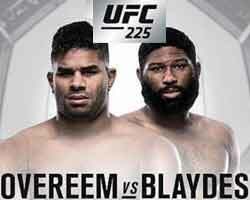 Overeem vs Blaydes is on the undercard of Robert Whittaker vs Yoel Romero 2 – UFC 225. Watch the video and rate this fight!